David MacAdam (July 1910 – March 1998), American physicist, made important contributions to the field of color perception. One of his experiments —maybe the most famous— consisted of showing to different colors to a subject. The first color —reference color— would remain the same, whereas the second could be adjusted by the subject, who was asked to modify it until he/she found it identical to the reference color. Due to the limited accuracy of human eyesight, the result was always subject to some margin of error. Even so, MacAdam was able to show that the color that the observer chose as identical to the reference one, even if it was slightly different with each experiment repetition, was always contained within an ellipse drawn in the CIE 1931 color diagram (see figure). The experiment was repeated for 25 different colors and, even though the results obtained were still within ellipses, these had different shapes and orientations depending of the diagram point we chose. Specifically, he proved that in the green palette, humans are less able to tell apart different hues than in the palette closer to blue. 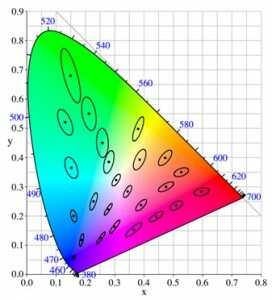 From this experimental basis, the MacAdam ellipses are used nowadays to determine the consistency among colors from the human perception point of view. Specifically, we define as one-step MacAdam ellipse the one in which interior most people are unable to perceive color differences. If, on the contrary, we are within an area of color variation twice as big, we will be in a two-steps MacAdam ellipse (also known as 2-SDCM), where we can start perceiving some variations between colors. Similarly, in a three-steps MacAdam ellipse (3-SDCM) differences would be more noticeable. And so on. Due to the variability of colors produced in the manufacturing of LED, the MacAdam ellipses are a very useful measuring tool to define color dispersion between bins. Bins contained within the MacAdams ellipses inferior to the 3-steps (3 SDCM) offer very good results.